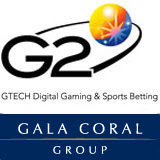 Gala Coral Group is adding side games from GTECH G2 to their bingo and casino sites (Galabingo.com, Galacasino.co.uk, Eurobet.com and Coral.co.uk). The first of the new games to launch will be the Bar X Magic 7 slot machine, an online version of the game that is popular in bingo halls across the UK, followed by the Bar X 5 and Bar X 125. A set of other side games will be added before the end of the year. Bar X is a brand that has been around for thirty years and is well established with over 55,000 machines in bingo halls and gaming arcades throughout the UK and Ireland. The online version of the Electrocoin Bar X Magic 7 is a three reel, single line fruit machine developed by the games designers at Dynamite Idea, who are specialised in developing innovative online interactive betting games including several unique hi lo, dice and number games. Instant win side games have become more than a supplemental revenue stream for online casino and bingo operators, many of which derive 60% - 70% of their income from these product offerings. Gala Coral Group is the only gambling company in the UK with significant businesses in the bookmaking, bingo and casino markets, both on the high street and online. GTECH G2 combines the software development and customer management expertise of Boss Media, Finsoft, Dynamite Idea and St Minver and operates the International Poker Network and International Bingo Network.